Jakarta Governor, Anies Baswedan has inaugurated two Asian Games venues and 10 sport halls (GOR) in Jakarta, Monday (8/13). 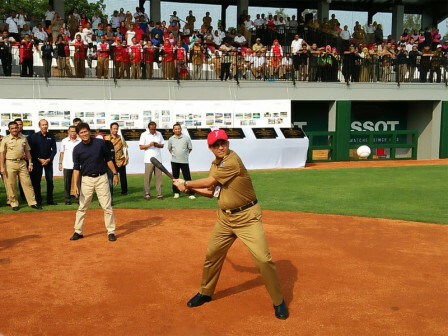 The inauguration itself is centered on the baseball Velodrome, Rawamangun, East Jakarta.
" We thank all those who have worked optimally. Thus the construction and rehabilitation of this sports facility is on time"
"We thank all those who have worked optimally. Thus the construction and rehabilitation of this sports facility is on time," he stated. Those venues are Jakarta International BMX Track (JIBT) in Pulomas and Jakarta International Baseball Area (JIBA) in Rawamangun, East Jakarta. Then 10 new sport venues that have been rehabilitated are Youth Center venues of Central Jakarta, North Jakarta, West Jakarta, South Jakarta, and East Jakarta. There are also Ragunan Student Sports Training Center, Pulo Gadung Youth Center Venue, Tanjung Priok Youth Center Venue, Cempaka Putih Youth Center Venue, and Soemantri Brodjonegoro Kuningan Student Center Venue. According to him, all these sports facilities will be used for training and matches. Especially baseball and BMX stadiums are as the best facilities in Indonesia and international standards. Even these two venues are one of the best sports facilities in the world. His side also wants from this sports facility Indonesia will achieve success in the future. Because the measure of success is the availability of good quality sports facilities prior to the Asian Games and all targets are achieved. "The next challenge is this facility must be a place for national and international athletes to grow. Good facilities must be used properly," he said. Jakarta Youth and Sports Dept. Head, Rationo added that the basis for the implementation of rehabilitation and development is Presidential Instruction number 48 on additional tasks of Jakarta in preparing for the 2018 Asian Games. That is to prepare facilities for the needs of the Asian Games in accordance with additional tasks for Jakarta Provincial Government. "The construction and rehabilitation began in 2017 until July 2018," he uttered. Rehabilitation for 10 venues are started from November 2017 until March 2018. While for JIBT construction is from January-July 2018 and JIBA is from April-July 2018.